This paper reviews the current status and future trends in robot vision technology. Centering on the core technology of 3-dimensional (3D) object recognition, we describe 3D sensors used to acquire point cloud data and the representative data structures. From the viewpoint of practical robot vision, we review the performance requirements and research trends of important technologies in 3D local features and the reference frames for model-based object recognition developed to address these requirements. Regarding the latest development examples of robot vision technology, we introduce the important technologies according to purpose such as high accuracy or ease-of-use. Then, we describe, as an application example for a new area, a study of general-object recognition based on the concept of affordance. In the area of practical factory applications, we present examples of system development in areas attracting recent attention, including the recognition of parts in cluttered piles and classification of randomly stacked products. Finally, we offer our views on the future prospects of and trends in robot vision. M. Hashimoto, Y. Domae, and S. Kaneko, “Current Status and Future Trends on Robot Vision Technology,” J. Robot. Mechatron., Vol.29, No.2, pp. 275-286, 2017. P. J. Besl and N. D. McKay, “A Method for Registration of 3-D Shapes,” IEEE Trans. Pattern Analysis and Machine Intelligence (PAMI), Vol.14, No.2, pp. 239-256, 1992. S. Granger and X. Pennec, “Multi-scale EM-ICP: A Fast and Robust Approach for Surface Registration,” European Conf. on Computer Vision, Vol.2353, pp. 418-432, 2002. D. Chetverikov, D. Svirko, D. Stepanov, and P. Krsek, “The Trimmed Iterative Closest Point Algorithm,” Proc. Int. Conf. on Pattern Recognition, Vol.3, pp. 545-548, 2002. T. ZinBer, J. Schmidt, and H. Niemann, “A Refind ICP Algorithm for Robust 3-D Correspondence Estimation,” Proc. Int. Conf. on Image Processing, Vol.3, pp. II-695-8, 2003. S. Kaneko, T. Kondo, and A. Miyamoto, “Robust Matching of 3D Contours using Iterative Closest Point Algorithm Improved by M-estimation,” Pattern Recognition, Vol.36, Issue 9, pp. 2041-2047, 2003. A. W. Fitzgibbon, “Robust Registration of 2D and 3D points sets,” Image and Vision Computing, Vol.21, pp. 1145-1153, 2003. J. M. Phillps, R. Liu, and C. Tomasi, “Outlier Robust ICP for Minimizing Fractional RMSD,” Int. Conf. on 3-D Digital Imaging and Modeling, pp. 427-434, 2007. A. Nuchter, K. Lingemann, and J. Hertzberg, “Cached K-d Tree Search for ICP Algorithms,” Int. Conf. on 3-D Digital Imaging and Modeling, pp. 419-426, 2007. K. Tateno, D. Kotake, and S. Uchiyama, “A Model Fitting Method Using Intensity and Range Images for Bin-Picking Applications,” IEICE Trans. Inf.& Syst., Vol.J94-D, No.8, pp. 1410-1422, 2011 (in Japanese). K. Ikeuchi and S. B. Kang, “Assembly Plan from Observation,” AAAI Technical Report FS-93-04, pp. 115-119, 1993. H. Murase and S. K. Nayar, “3D Object Recognition from Appearance – Parametric Eigenspace Method –,” IEICE Trans. Inf.& Syst., Vol.J77-D-II, No.11, pp. 2179-2187, 1994 (in Japanese). S. Ando, Y. Kusachi, A. Suzuki, and K. Arakawa, “Pose Estimation of 3D Object Using Support Vector Regression,” IEICE Trans. Inf.& Syst., Vol.J89-D, No.8, pp. 1840-1847, 2006 (in Japanese). Y. Shibata and M. Hashimoto, “An Extended Method of the Parametric Eigenspace Method by Automatic Background Elimination,” Proc. Korea-Japan Joint Workshop on Frontiers of Computer Vision, pp. 246-249, 2013. 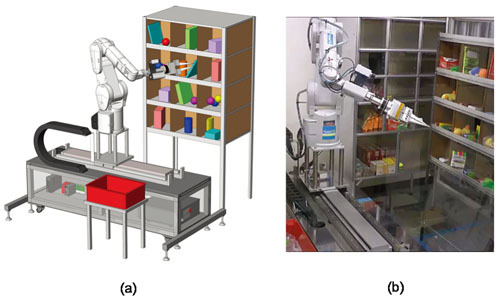 H. Yonezawa, H. Koichi et al., “Long-term operational experience with a robot cell production system controlled by low carbon-footprint Senju (thousand-handed) Kannon Model robots and an approach to improving operating efficiency,” Proc. of Automation Science and Engineering, pp. 291-298, 2011. H. Do, T. Choi et al., “Automaton of cell production system for cellular phones usng dual-arm robots,” J. of Advanced Manufacturing Technology, Vol.83, No.5, pp. 1349-1360, 2016. F. Tombari, S. Salti, and L. D. Stefano, “Unique Signatures of Histograms for Local Surface Description,” European Conf. on Computer Vision, pp. 356-369, 2010. B. Drost, M. Ulrich, N. Navab, and S. Ilic, “Model Globally, Match Locally: Efficient and Robust 3D Object Recognition,” IEEE Computer Vision and Pattern Recognition, pp. 998-1005, 2010. C. Choi, Y. Taguchi, O. Tuzel, M. Liu, and S. Ramalingam, “Voting-Based Pose Estimation for Robotic Assembly Using a 3D Sensor,” IEEE Int. Conf. on Robotics and Automation, pp. 1724-1731, 2012. S. Akizuki and M. Hashimoto, “High-speed and Reliable Object Recognition Using Distinctive 3-D Vector-Pairs in a Range Image,” Int. Symposium on Optomechatronic Technologies (ISOT), pp. 1-6, 2012. A. Mian, M. Bennamoun, and R. Owens, “On the Repeatability and Quality of Keypoints for Local Feature-based 3D Object Retrieval from Cluttered Scenes,” Int. J. of Computer Vision, Vol.89, Issue 2-3, pp. 348-361, 2010. Y. Guo, F. Sohei, M. Bennamoun, M. Lu, and J. Wan, “Rotational Projection Statistics for 3D Local Surface Description and Object Recognition,” Int. J. of Computer Vision, Vol.105, Issue 1, pp. 63-86, 2013. S. Takei, S. Akizuki, and M. Hashimoto, “SHORT: A Fast 3D Feature Description based on Estimating Occupancy in Spherical Shell Regions,” Int. Conf. on Image and Vision Computing New Zealand (IVCNZ), 2015. S. Akizuki and M. Hashimoto, “DPN-LRF: A Local Reference Frame for Robustly Handling Density Differences and Partial Occlusions,” Int. Symposium on Visual Computing (ISVC), LNCS 9474, Part I, pp. 878-887, 2015. H. Kayaba, S. Kaneko, H. Takauji, M. Toda, K. Kuno, and H. Suganuma, “Robust Matching of Dot Cloud Data Based on Model Shape Evaluation Oriented to 3D Defect Recognition,” IEICE Trans. D, Vol.J95-D, No.1, pp. 97-110, 2012. S. Kaneko, T. Kondo, and A. Miyamoto, “Robust matching of 3D contours using iterative closest point algorithm improved by M-estimation,” Pattern Recognition, Vol.36, pp. 2041-2047, 2003. Y. Domae, H. Okuda, Y. kitaaki, Y. Kimura, H. Takauji, K. Sumi, and S. Kaneko, “3-D Sensing for Flexible Linear Object Alignment in Robot Cell Production System,” J. of Robotics and Mechatronics, Vol.22, No.1, pp. 100-111, 2010. Y. Domae, S. Kawato et al., “Self-calibration of Hand-eye Coordinate Systems by Five Observations of an Uncalibrated Mark,” CIEEJ Trans. On Electronics, Information and Systems, Vol.132, No.6, pp. 968-974, 2011 (in Japanese). R. Haraguchi, Y. Domae et al., “Development of Production Robot System that can Assemble Products with Cable and Connector,” J. of Robotics and Mechatronics, Vol.23, No.6, pp. 939-950, 2011. A. Noda, Y. Domae et al., “Bin-picking System for General Objects,” J. of the Robotics Society of Japan, Vol.33, No.5, pp. 387-394, 2015 (in Japanese). Y. Domae, H. Okuda et al., “Fast graspability evaluation on single depth maps for bin picking with general grippers,” Proc. of ICRA, pp. 1997-2004, 2014. N. Correll, K. E. Bekris et al., “Lessons from the Amazon Picking Chllenge,” CarXiv:1601.05484, 2016. R. Jonschkowski, C. Eppner et al., “Probabilistic Multi-Class Segmentation for the Amazon Picking Challenge,” http://dx.doi.org/10.14279/depositonce-5051, 2016. I. Lenz, H. Lee et al., “Deep Learning for Detecting Robotic Grasps,” Proc. of ICRA, pp.1957-1964, 2016. L. Pinto and A. Gupta, “Supersizing Self-supervision: Learning to Grasp from 50K Tries and 700 Robot Hours,” arxiv:1509.06825, 2015. S. Levine, P. Pastor et al., “Learning Hand-Eye Coordination for Robotic Grasping with Deep Learning and Large-Scale Data Collection,” arXiv:1603.02199, 2016. C. Finn, X. Y. Tan et al., “Deep Spatial Autoencoders for Visuomotor Learning,” arXiv:1509.06113, 2016. T. Komuro, Y. Senjo, K. Sogen, S. Kagami, and M. Ishikawa, “Real-Time Shape Recognition Using a Pixel-Parallel Processor,” J. of Robotics and Mechatronics, Vol.17, No.4, pp. 410-419, 2005. T. Senoo, Y. Yamakawa, Y. Watanabe, H. Oku, and M. Ishikawa, “High-Speed Vision and its Application Systems,” J. of Robotics and Mechatronics, Vol.26, No.3, pp. 287-301, 2014.